Italian cinema moves in popular waves; after the sucess of Hercules (1958) and Hercules Unchained (1959), the peplum became the popular genre and for four years the majority of Italian cinematic output comprised bulky heros fighting evil. Having already helped shoot several of the genre's earliest entries and making a big splash with his directoral debut Black Sunday (1960), Mario Bava was the obvious choice to helm this horror tinged peplum. Co-written by Bava and the Peplum regular Duccio Tessari, the story behind Hercules in the Haunted World is a pretty standard Peplum plot - Hercules travels around, finds a problem, learns of the 'impossible' challenges needed to solve the problem, sets out to do them all and save the day - references to Greek mythology abound, including links to Homer's Odyssey and plenty of name dropping. 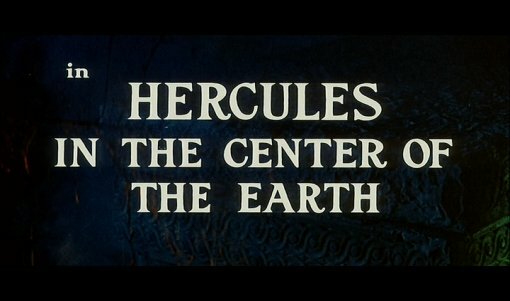 The script includes the usual array of chances to show off Hercules' strength, although there are not many fight scenes here and the focus is more on Hercules having to solve problems. What makes the film most distinctive is the setting - a Hadean underworld where reality bends and the eye can deceive. Hercules (or at least his strong-man cousin Maciste) had been to Hell during the original silent movie Peplum era, in Maciste all'inferno (1925) (which would be remade in 1962 by Riccardo Freda) and although never quite going for the Dantean vision of the silent movie, Hercules in the Haunted World does take advantage of the setting for some unique set-pieces. Sadly a very grating comic relief character proves particularly annoying in several scenes and his last lines end the film on a very silly note. The pacing is good, the film moving without many problems, although presumably due to the low budget, the climactic battle is rather anti-climactic. This film and its potentially daft premise really works, thanks to the highly impressive direction from Mario Bava. For the most-part he abstains from the exteriors that take up most of these films, with almost all the action taking place on sets - this allows Bava much greater control over the atmosphere. Lit with red and green, the sets are dark and mysterious, and particularly in the Hades sequence give the film a very other-worldly feel. The music is light and typical of the genre and fits very well. Reg park played five Herculean characters in an all too brief career - a three time Mr Universe, he is even more heavily built than genre icon Steve Reeves and his acting is surprisingly convincing. Christopher Lee had risen to quick horror movie fame with a quartet of Hammer Horror pictures and in 1961 had moved to work in Europe, his villanous reputation is played up well here and he gives a typically strong performance. The rest of the cast, including the beautiful Ida Galli (Django Shoots First (1966)), a very buff George Ardisson (Grand Canyon Massacre (1965)) and a young Rosabela Neri (Lady Frankenstein (1972)) look fine in their roles. These days the Peplum films are often overlooked as pure trash cinema and especially in the English dub, Hercules in the Haunted World is a pretty bizarre film with some silly comedy - but with its very impressive direction, a unique setting and a good cast it is certainly a genre highlight and an entertaining watch. A must see for all Peplum and Bava fans and a great starting place for newcomers to both. Anyone famous in it? Christopher Lee - A horror icon of the 1960s who made his name in Britian but worked widely in Europe. Directed by anyone	interesting? Mario Bava - Often considered to be one of the best European cinema directors he directed a wide range of films, but was most at home in the horror genre helming such classics as Kill, Baby, Kill (1966). Who is it for? Certainly one for all Peplum and Mario Bava fans to see. The print is decent - very grainy and rather soft in places (although this is sometimes deliberate) with some damage, it is miles better than most of the PD peplum prints and always watchable. Audio Italian and English tracks. Both sound good. Subtitles English - translation of the Italian track. Picture galleries - manually scrolling mix of publicity shots and promotional materials. Liner notes by Mario Bava biographer Tim Lucas - very detailed. Cuts? The film is believed to be uncut. The print used is the English print. A typical Traditional Peplum plot is lifted by strong direction and a good cast. A must see for Peplum and Bava fans. A strong print - one of the best looking Pepla on DVD - and the ability to watch in Italian with subs is a real bonus. Find our reviews of other, Pepla and films starring Christopher Lee or Reg Park and directed by Mario Bava. All text in this review written by Timothy Young - 7th August 2006.